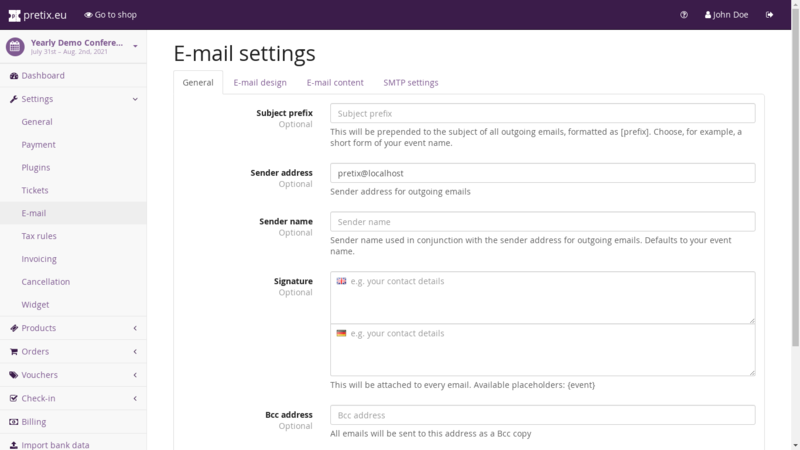 The settings at “Settings” → “E-mail” allow you to customize the emails that pretix sends to the participants of your event. The page is separated into four parts: “E-mail settings”, “E-mail design”, “E-mail content” and “SMTP settings”. We will explain all of them in detail on this page. This text will be prepended to the subject of all e-mails that are related to your event. For example, if you set this to “dc2018” all subjects will be formatted like “[dc2018] Your payment was successful”. All e-mails will be sent with this address in the “From” field. If you use an email address at a custom domain, we strongly recommend to use the SMTP settings below as well, otherwise your e-mails might be detected as spam due to the Sender Policy Framework and similar mechanisms. This text will be appended to all e-mails in form of a signature. This might be useful e.g. to add your contact details or any legal information that needs to be included with the e-mails. This email address will receive a copy of every event-related email. In this part, you can choose and preview the layout of your emails. More layouts can be added by pretix plugins. The next part of the page allows you to customize the exact texts of all e-mails sent by the system automatically. You can click on the different boxes to expand them and see the texts. This e-mail is sent out to every order directly after the order has been received, except if the order total is zero (see below). It should specify that/how the order is to be paid. This e-mail is sent out as soon as the payment for an order has been received and should give the customer more information on how to proceed, e.g. by downloading their ticket. This e-mail is sent out instead of “Placed Order” and “Paid Order” if the order total is zero. It therefore should tell the same information, except asking the customer for completing their payment. This e-mail will be sent out if you click the “Resend link” next to the e-mail address field on the order detail page. It should include the link to the order and can be sent to users e.g. if they lost their original e-mails. Customers can also request a link to all orders they created using their e-mail address themselves by filling out a form on the website. In this case, they will receive an e-mail containing a list of all orders they created with the respective links. This e-mail is sent out if you change the content of the order and choose to notify the user about it. This e-mail is sent out a certain number of days before the order’s expiry date. You can specify the number of days before the expiry date that this should happen and the e-mail will only ever be sent if you do specify such a number. The text should ask the customer to complete the payment, tell the options on how to do so and the consequences if no payment is received (ticket gone, depending on your other settings). You should also include a way to contact you in case of questions. If you enable the waiting list feature, this is the mail that will be sent out if a ticket is assigned to a person on the waiting list. It should include the voucher that needs to be redeemed to get the free spot and tell how long that voucher is valid and where to redeem it. This e-mail is sent to a customer if their order has been canceled. You can use pretix’ admin interface to directly send an e-mail with a custom text to the customer of a specific order. In this case, this will be the default text and might save you time by not having to re-type all of it every time. If you want, you can configure an email that will be send out a number of days before your event to remind attendees to download their tickets. The e-mail should include a link to the ticket download. This e-mail will only ever be sent if you specify a number of days. If you configure one of your products to “require approval”, orders of that product will not immediately be confirmed but only after you approved them manually. In this case, the following e-mail templates will be sent out. After an order has been received, this e-mail will be sent automatically instead of the “order placed” e-mail from above. This e-mail will be sent after you manually approved an order. This should include instructions to pay for the order, which is why this will only be used for a paid order. For a free order, the “free order” e-mail from above will be sent. This e-mail will be sent out to customers when their order has been denied. If you want to send your e-mails via your own e-mail address, we strongly recommend to use SMTP for this purpose. SMTP is a protocol that is used by e-mail clients to communicate with e-mail servers. Using SMTP, pretix can talk to your e-mail service provider the same way that e.g. the e-mail app on your phone can. Your e-mail provider will most likely have a document that tells you the settings for the various fields to fill in here (hostname, port, username, password, encryption). With the checkbox “Use custom SMTP server” you can turn using your SMTP server on or off completely. With the button “Save and test custom SMTP connection”, you can test if the connection and authentication to your SMTP server succeeds, even before turning that checkbox on. If you use an email address of your own domain as a sender address and do not use a custom SMTP server, it is very likely that at least some of your emails will go to the spam folders of their recipients. We strongly recommend to use your organization’s SMTP server in this case, making your email really come from your organization. If you don’t want that or cannot do that, you should add the pretix application server to your SPF record. Then, please contact support@pretix.eu and we will enable DKIM for your domain on our mail servers.